A fairly normal tropo opening during the early morning hours on July 20 into the Norfolk, VA area brought in an extra surprise: two new FM stations. I turned my antenna to local 97.1 WASH’s null point expecting classic hits “97-1 The Wave” WAVD from nearby Ocean City, but instead I heard Christian Contemporary music. The station identified as an affiliate of “K-Love,” which matches to 97.1 WYND. Unfortunately, my audio recorder was not running when the station IDed, and WYND left just as fast as it arrived under WASH’s strong signal. Shortly afterward, I heard sports music on 102.7 FM. I figured it could’ve been a previously-logged station airing a local sports program, but something made me keep on listening. Instead, the station identified as “99-5 and 102-7 ESPN,” which is a 250-watt translator from central Virginia. My DX Log and RDS/HD Radio Screenshots pages have been updated with the new content below. Another great tropo duct into coastal North Carolina–the second in a week–was heard throughout the overnight hours on July 14. The opening started with the typical summer night signals from Norfolk, VA (130 miles) and Ocean City, MD (90 miles) coming in with local-grade strength. Quickly afterward, signals further south from the New Bern/Greenville/Jacksonville, NC area at up to 240 miles away came in, some with HD Radio. This was when my local Washington, DC stations started to disappear, one by one, overtaken by distant North Carolina signals. This was largely an FM-only opening. The TV band was largely only limited to Norfolk and Richmond stations. My DX Log and RDS/HD Radio Screenshots pages have been updated with the new content below. For the first time since 2016, a respectable Sporadic E-Skip opening was received in Virginia. During the opening, I logged my 1900th FM station ever received. The day also marked the second time in 19 years that I received a radio station from Mexico. I had to work all day and wasn’t able to DX my radios live, but I fared pretty well with two radios set to record from 89.1 and 93.5 FM. The skip started in my car as I was headed to work at 8:52 AM with an unID 88.1 signal with undecoded RDS. My home radios didn’t get any FM Es until 10:54 AM, when signals from south Florida boomed in for over three hours. An outlier fade-in from Nebraska was also heard at one point. The FM Es abruptly ended at 3:14 PM, and then returned at 6:05 PM for about 2 minutes into the Cancun area. A few brief returns of FM Es during the 6PM and 7PM hours, totaling about 15 more minutes, happened before the marathon opening finally ended. Overall, 208 minutes of FM Es was observed on June 6, which is 6.3 times as many minutes as heard during the entire 2017 FM Es season, and half of what was heard in the entire 2016 FM Es season. This opening confirms that my new indoor Yagi antenna setup works perfectly fine for Sporadic E, much to my delight. I was concerned that having an indoor antenna would attenuate signals and/or cause Sporadic E not to be received. Thankfully, I was wrong. Click on the audio players to hear the new logs below. My DX Logs have been updated with these new loggings. While in my car located in Sterling, VA on February 24, I received three new stations and picked up RDS from four other previously-logged signals that I had not received RDS from before. I consider any new signal received within 30 miles of my home to be eligible to be added to my FM DX Log. As Sterling, VA is 25 miles northwest of my home, the signals below are eligible to be added. 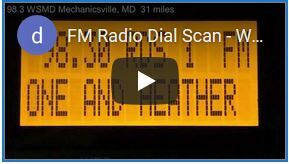 My FM DX Log, HD Radio/RDS Screenshots, and Audio pages have been updated with the new content below. An tropo opening brought in signals up to 240 miles into Virginia Beach and coastal North Carolina on October 22, including a new translator on 100.1, a frequency usually full of IBOC interference from local 100.3 WBIG. Also in were first-time HD Radio and RDS decodes from multiple signals. My DX log, RDS/HD Radio Screenshots, and Audio pages have been updated with the new content below. Tropo reception has picked up for the second day in a row in Northern Virginia. During the early morning hours of October 5, signals were enhanced up to 150 miles away into southeast Pennsylvania and southern New Jersey, with many signals coming in over locals (94.7 WDSD over local WIAD, WJBR over local WIHT, 101.1 WBEB over local WWDC, among others). For the first time, I logged 105.5 WAIV, a pleasant surprise, given 105.5 is crowded frequency in this area, usually occupied by nearby translator W288BS Reston VA, WRAR Tappahannock, VA, WOJL Louisa, VA, and other signals. I also logged RDS for the first time from relog 90.3 WNJZ. My DX log, RDS/HD Radio Screenshots, and Audio pages have been updated with the new content above. During minor tropospheric enhancement in the past week, I received two new stations. 105.7 WQXA came in briefly over semi-local 105.7 WJZ Baltimore. WJZ is usually with RDS strength at my home, so receiving WQXA was a welcome surprise. I’ve been trying to get WQXA for years. 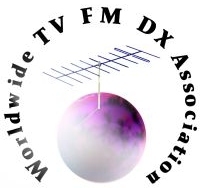 A few days before WQXA’s logging, I received 19 WCAV from Charlottesville, VA. Ever since I started to DX digital TV again last month, I often received a weak DTV signal on channel 19 below the threshold to decode an identifiable signal. That changed on August 13 with a positive logging. My DX log, TV Screenshots, and Audio pages have been updated with these new stations. It’s a rarity these days that tropo under 150 miles brings in any new stations, but that is exactly what happened during the early morning hours of June 16. I received strong tropo from the Delmarva Eastern Shore and with it, three new signals, two over local frequencies. 88.5 WHRG was found on a whim when tuning by local WAMU. I heard a slight “repeat” in the NPR audio superimposed over WAMU and found out it was an entirely different station I didn’t know existed. 101.5 WOWZ has been on my radar since they signed on last year, but I didn’t think I’d get them over local WBQB, which is a very strong signal at my home. Equally surprising was 105.7 W289CE. I thought it was 105.7 WRSF from Coastal NC, but it was coming in way too strong, and the other usual coastal NC relog signals that appear with WRSF were absent. I’m glad I kept on listening. I also added 25 new RDS signals from relogs; 98.3 WHRL’s RDS being the first time received from that station. My DX Logs, Audio and RDS/HD Radio Screenshots pages have been added with the new content below. The weak, peekaboo “here one second, gone the next” Sporadic E that I’ve seen so far in the 2017 season continued on June 13. At about 4:00 PM, I found signals from Arkansas and Kansas coming into Northern Virginia. Although I had to do some non radio-related things during the opening, I found incoming signals from Minnesota and Nebraska before the opening died at about 5:17 PM, roughly 10 minutes of cumulative skip with a MUF of 105.3 FM. Interestingly, much like the May 28, 2017 opening, I managed to log 4 new stations–something that is usually very difficult to achieve with weak and short openings, which usually only yield relogs. My Audio page has been updated with the new clips below. In a totally unexpected turn of events, I received the first new TV station in almost 4 years — without a TV. As you may know, analog TV 6 is about 87.75 FM. After the 2009 DTV transition, many major markets gained an LPTV station on these frequencies, Washington, DC included. Over time, many of them converted their audio to FM stereo, often also with RDS. DC’s 87.7 WDCN-LP does just this. WDCN’s signal is very weak at my home. I was trying to fine tune reception during a minor tropo opening on June 11. Unexpectedly, I received another station over WDCN, WNDC-LP from Salisbury, MD. Since this is technically a TV station, my TV Log have been updated with this new station. I also decided to list 87.7 FM signals in my FM Log since they are, for all intents and purposes, received and operate as FM signals, but they are only counted as TV stations in my totals. My Audio section was also updated with WNDC’s clip below.